Q. I was looking over your advice concerning study Bibles and wanted to ask your opinion of the Thompson chain reference Bible. This Bible has an interesting system of references and topic chain of verses, etc. Do you know of it and have you used it? I am somewhat aware of the other study Bibles you reviewed (i.e., Ryrie, Scofield). I was considering the purchase of the Thompson and thought I'd get some advice about it, if possible, to help decide if I want to purchase it. Any comments would be appreciated. Also, what version do you recommend for a study Bible? From what I can tell you seem to have confidence in the NKJV and also like the NASB. Since I cannot purchase the Thompson in both versions, which version would you recommend most? (It's also available in the NIV and the KJV). I might also buy a Ryrie—is the Ryrie better in the KJV, the NASB or even the NIV? Any comments on the Thompson and any further comments on the Ryrie (since you've already addressed this from another question) as study Bibles would be most helpful. A. I am somewhat familiar with the Thompson Chain-Reference Study Bible and own the NKJV version. It is a reasonable study bible in many regards—especially for topical and character studies. As a stand-alone study resource, it offers a tremendous value. The quality of construction—especially of the more expensive versions which can be ordered directly from the manufacturer—is very, very high. Cross-References—When adapting the NKJV text for use in the Thompson Chain-Reference Study Bible, the extensive set of cross references which normally accompany the NKJV text (in other study bibles) has been omitted from the Thompson Chain-Reference version. Since I believe that cross-references to related passages is one of the most important aids for bible study, this is a significant drawback. This is made up somewhat by the addition of the study chains (which link passages on related topics), but the topical chains don't always treat or link to passages which are important. One of the problems inherent with any topical treatment of the biblical text is the unavoidable personal bias which attends identification of topics for any given passage. The person defining the topics may overlook or omit important themes—especially if they hold a different theological outlook (e.g., covenant vs. dispensational, postmillennial vs. premillennial) than the person using the resource. In my view, the wealth of information found in the topic chains is eroded significantly by having dropped the pure passage cross-references. Where the Thompson bible adds pointers to related passages, they are often quite skimpy (like the Scofield Study Bible). If they had elected to retain the standard 60,000 cross-references which Nelson has for the NKJV text and added their own topical chains, it would have been much stronger. Covenant Theology—The paragraph headings and topic lists which are included in the work often reflect a Covenant Theology bias. That is, they blur the distinction between Israel and the church, often reading the church back into OT passages which pertain to Israel and ignoring the strong biblical evidence that the church began on the Day of Pentecost (Acts 2). There is also the typical confusion of Covenant Theology which fails to recognize the distinction between various important OT covenants (plural)—viewing them instead as a single covenant. Prophecy—There is a tendency to spiritualize prophetic passages and an unwillingness to define topics related to prophetic themes. For example, at Revelation 13:1, you will search in vain for any reference to "Beast." Similarly, at Revelation 19:20 there will be nary a mention of the "False Prophet." Instead, you will find topics of a more devotional nature which treat the general principles related to the passage, but not the specific personalities and events—no matter how important these may be. This is not the bible for studying prophecy. If these weaknesses are kept in mind, the Thompson Chain-Reference Study Bible can be a very helpful resource in other ways. As to which version is best, as you have noted, my preference is toward both the NKJV and the NASB versions. This is because both the NKJV and the NASB provide reliable word-for-word translation of their respective Greek texts. I prefer the NKJV over the NASB because I prefer the Byzantine family of Greek texts behind the Majority Text (MT) and Textus Receptus (Received Text, TR) over the Alexandrian family of Greek texts favored by the Critical Text (CT) which is behind the NASB and most other modern translations. I also like the NKJV because it footnotes places where the CT and MT vary significantly from the TR (of the KJV and NKJV). This can be especially helpful when teaching, especially in a home group where others are using translations which follow the CT (e.g., NIV, NASB). The reason I mention both the NKJV and the NASB is that I prefer the Greek text behind the NKJV, but it has also been my experience that the NASB generally does a superior job of translating its Greek terms into English. So my ideal doesn't really exist: a version which follows the TR (or MT with TR differences noted), but translates individual words with the accuracy and consistency of the NASB. If you get both translations, you will be well served because you will be able to compare readings from the Textus Receptus (TR), Majority Text (MT), and Critical Text (CT) as well as have two excellent word-for-word renderings of the original language. In regard to the Ryrie Study Bible, I consider it a superior study bible to the Thompson Chain-Reference Study Bible. The main reasons are that the Ryrie Study Bible includes a more complete set of cross-references (although only a small subset are topically arranged) and treats prophetic passages on an equal footing with non-prophetic material. Even though the Thompson Chain-Reference Bible may include a larger number of topical chains and offer greater assistance for character studies, I believe the Ryrie Study Bible gives a more consistent treatment of the text and avoids the errors (in my view) of imposing Covenant Theology over the text. Although it is my understanding that the Ryrie Study Bible was once available in the NKJV text, it has been out of print for some time. Therefore, I would recommend purchasing the NASB version (or the KJV if you are comfortable with the "King's English"). A superior word-for-word English translation is the Literal Translation of the Holy Bible (LITV) by Jay P. Green available from Sovereign Grace Publishers. 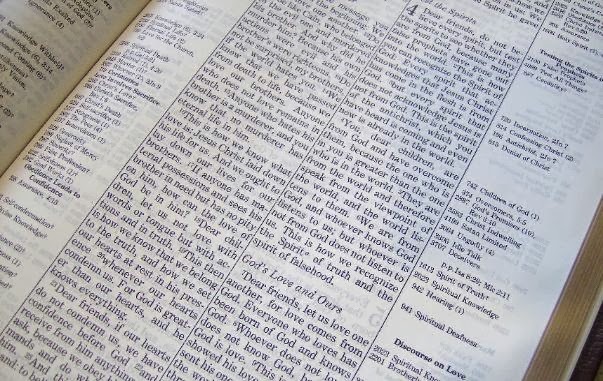 This is not a study bible and does not include cross-references or notes, but its consistent literal treatment of the underlying text can be most helpful for those who do not have access to the original languages. All translations include some interpretation. But good translations will minimize the amount of interpretation and preserve the ambiguities of the underlying text. Rather than simplifying the text by providing one interpretation (which may not be the correct one), they will pass the ambiguity on in the English and allow the reader to be aware of the various interpretive possibilities.